The General Officer Commanding (GOC) of Red Horns Division Major General Sanjeev Khatri made an official visit to Pothorughat on Wednesday and paid deep tribute to 140 martyrs of the historic peasants uprising by offering floral wreath at the ‘Krishak Swahid Memorial’ in military style and honour. Commanding Officer of 14 Garhwal Rifles Colonel Rahul Singh was also present in the homage paying function and briefed the GOC about the history of ‘Krishak Swahid Divas’. He also apprised Maj Gen Khatri about the project undertaken by the Government for transforming the site into a tourist centre at a cost of around Rs 7 crore. GOC Khatri also enquired about the preparation for this year’s celebration of ‘Farmers’ Martyr Day’ by the Army in the coming month. Meanwhile, the Northeast Now in presence of Bhargab Kumar Das, Adviser, Mangaldai Media Circle, assured of necessary initiative to carry forward the issue of historic Pothorughat to national level. Earlier the media persons greeted the visiting GOC with a ‘Phulam Bihuwan’ and ‘Aronai’ and also offered him a copy of the book ’Pothorughat’ written by eminent author Padmashree Arup Kumar Dutta. It may be mentioned that in September last, the then Chief of the Staff (COS) of Gajaraj Corps Major General Alok Raj and in June last, the then General Officer Commanding (GOC) of Red Horns Division Major General PS Behl also paid a visit to Pothorughat and offered tribute. It was at the initiative of the then Governor of Assam Lt. Gen (Retired) SK Sinha, the army in 2001 had constructed the ‘Krishak Swahid Memorial’ at Pothorughat. This memorial is the only of its kind in the entire country ever constructed by the Army in memory of civilian Krishak Swahids. And since then the ‘Friends in the Olive Green’ has been celebrating the ‘Krishak Swahid Divas’ every year with full military honour and style. The GOC of Red Horns Division has been taking part in this ‘Divas’ as the chief guest while in 2005, the GOC of Gajaraj Corps took part as the chief guest. 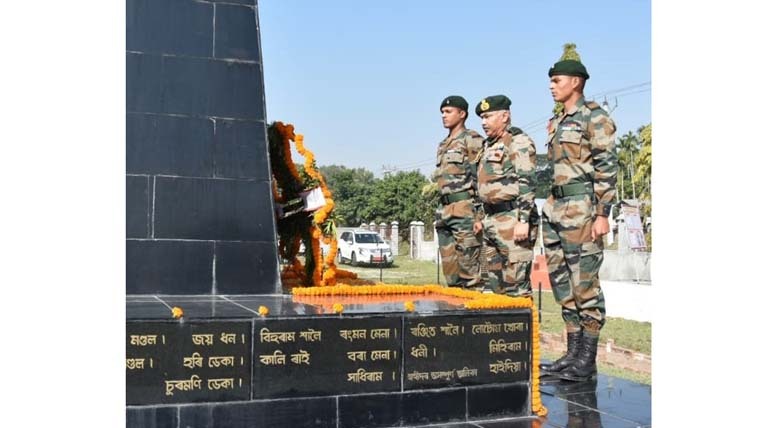 Besides taking part in the ‘Krishak Swahid Divas’ organized in quite a befitting manner by the Army, senior officials of the Army have made it a tradition to visit the ‘Krishak Swahid Memorial’. in June last, the then General Officer Commanding (GOC) of Red Horns Division Major General PS Behl had also paid a visit to Pothorughat and offered floral wreath at the Krishak Swahid Memorial.